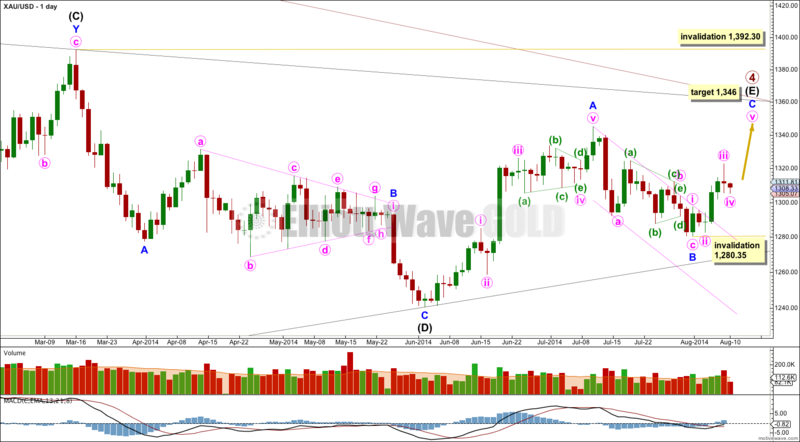 Last main hourly Elliott wave count expected a continuation of sideways movement as a fourth wave correction unfolds; this sideways movement was expected to continue for one or two days. The alternate hourly wave count was invalidated. Summary: Sideways movement may end within a few hours, then the upwards trend should resume. 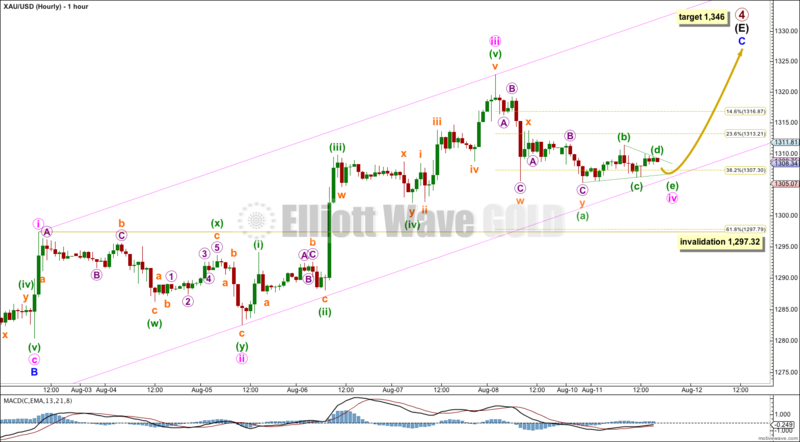 The target for this upwards wave to end remains at 1,346. I will be able to add to the target calculation at a second degree tomorrow, so tomorrow it may widen to a small zone or it may change. Within the triangle of primary wave 4 intermediate wave (E) is unfolding as a zigzag: minor wave A is a five wave impulse and minor wave B downwards is a zigzag. I have drawn a corrective channel about minor wave B downwards. This channel is now breached by a full candlestick above the channel and not touching it, confirming minor wave B is over and minor wave C upwards has begun. At 1,346 minor wave C would move slightly above the end of minor wave A at 1,345.22 and avoid a truncation. At 1,346 minor wave C would reach 0.618 the length of minor wave A. At 1,346 intermediate wave (E) would fall short of the (A)-(C) trend line. 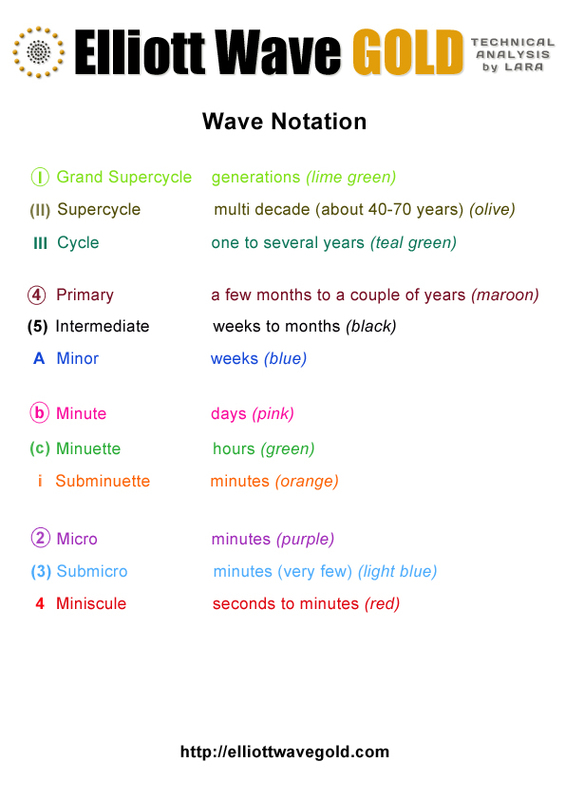 Sideways movement is a continuation of minute wave iv. A new low very slightly below 1,305.59 invalidated the alternate which saw this fourth wave correction complete, but clearly it is not over yet. There are still a few possible structures that minute wave iv may be taking. I have labeled it as a regular contracting triangle, but it may also be a combination or double zigzag. A triangle or combination are the most likely, and a double zigzag is technically possible but at this stage the least likely structure. 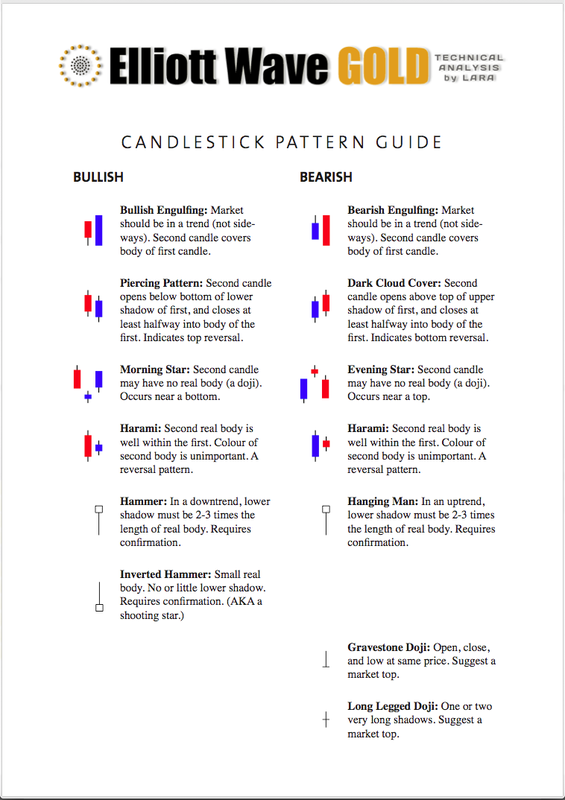 Triangles and combinations have the same purpose: to take up time and move price sideways. Whichever structure this fourth wave completes as I would expect only sideways movement, and I would expect price to find support if it gets to reach the lower edge of the pink channel. Minute wave ii was a deep 87% double zigzag. If minute wave iv is either a triangle or double combination it will show structural alternation with minute wave ii, and will most likely end about the 0.382 Fibonacci ratio of minute wave iii at 1,307.30. Minute wave ii lasted 49 hours. So far minute wave iv has lasted 39 hours. If it ends within the next 24 hours they will be reasonably in proportion, enough for the wave count to have the right look. At this stage I expect minute wave iv to end within the next few hours. Draw a channel about minor wave C using Elliott’s first technique: draw the first trend line from the ends of minute waves i to iii, then place a parallel copy on the end of minute wave ii. Minute wave iv may not move into minute wave i price territory below 1,297.32. When I know where minute wave iv has ended then I can use the ratio between minute waves i, iii and v to add to the target calculation for minor wave C to end. I cannot do this yet and may be able to do it for you tomorrow. The target at 1,346 may widen to a small zone or it may change tomorrow. At this stage I would expect minute wave v to most likely be about even in length with minute wave iii at $40.28. If minute wave iv ends in a few hours and minute wave v lasts about three days, then the target at 1,346 may be met within three or four days time. This analysis is published about 05:04 p.m. EST. Lara, this doesn’t look as good as it once did this AM. Back out of channel. Redraw the channel using Elliotts second technique. Fourth waves are not always perfectly contained in a channel drawn using the first technique. Which is why Elliott developed a second technique. I think your suggestion is exactly what is happening. I would expect this fourth wave correction has morphed into a double combination. It may move just a little lower to about 1,301. Its now just outside of the pink channel. So when this fourth wave is done we need to redraw the channel. I also see gold coming out of a triangle very soon. However, could it be that the triangle began at the spot where you have an orange x (price just above 1313)? Moreover, because the movement before the triangle was down, movement out of the triangle should be the same, correct? That movement out of the triangle should then be brief in time and length, but should equal the greatest width of the triangle. That would have the movement out of the triangle end somewhere between 1298-1300, which would keep price above the invalidation point, but would cause us to have to redraw the pink channel (using Elliott’s second technique?). I, too, see gold going up toward the 1246 area, as soon as all of this is complete. Am just wondering about the possibility of gold briefly touching/breaking 1300 before that happens. What I am suggesting would have the consequence of minute wave v being longer than minute wave iii, but perhaps that is not so far fetched considering that this would come immediately before the beginning of a massive primary wave 5 down. Thanks.